Henry James Ackerman was the son of George & Elizabeth Ackerman of 4 Gendros Terrace, Carmarthen Road. He was born in 1912. He was always known as Harold. He was educated at Gendros School and joined his uncle’s bakery business when he left school. He enlisted in the Royal Welch Fusiliers as a private soldier but in the spring of 1942 volunteered for special duties. His application was successful and in late-September 1942 he was temporally attached to the 13th Battalion, The King's Regiment (Liverpool). The 13th set sail for India on 8 December 1942. They were originally designated to undertake garrison and security duties at Secunderabad, but they were re-tasked and allocated to Major - General Orde Charles Wingate as his experimental Chindit infantry. They docked at Mumbai and Private Ackerman passed through the famous Deolali Army Camp, after which he was formally attached to the 13th. He then journeyed to the Central Provinces of India to join training for the first Chindit Operation on 30 September at a place called Saugor. The Chindits were the largest of the Allied Special Forces. They were trained in guerrilla tactics and jungle warfare in preparation for operations in the dense Burmese rainforest then occupied by the Japanese. Private Ackerman was assigned to Major Bernard Fergusson's Column 5, one of 8 separate Columns established by General Wingate. He undertook further training in map and compass reading, river craft, animal husbandry, and the techniques of jungle survival. When his training was complete, he joined the Animal Transport section of Column 5 where he took charge of one of the unit's bullocks. The Chindits moved up to Imphal in Assam in January 1943. Column 5 crossed the Chindwin River into Burma on 15 February, swimming their animals across the river. Column 5 had orders from General Wingate to destroy the Mandalay Railway at a place called Bonchaung, which they achieved with some success. In late-March the General ordered the Chindits to return to India for dispersal, and the Columns split into small groups to evade enemy forces. The return journey required Column 5 to cross several large Burmese rivers and on 1 April Column 5 began to ford the fast-flowing Shweli River. They swam to what they believed was the far bank but was actually a large sandbank in the middle of the river, 200 yards short of their goal. Exhausted from the privations of their task and suffering from the effects of malnutrition, the challenge proved too much for some of the men who slumped down on the sand bank to rest. Major Fergusson and his officers urged his men to attempt to complete the crossing to avoid a Japanese patrol that had closed in on the party. But his men were too weak to attempt the challenge and some 40 soldiers from Column 5 were captured by the Japanese, including Private Ackerman. The prisoners were taken to a holding camp in the jungle. As the days past, more and more exhausted Chindits were captured by the Japanese and taken to various prisoner of war camps before all of the prisoners were sent to Rangoon Central Jail. 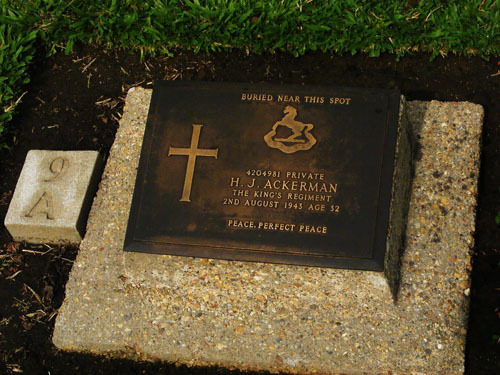 Private Ackerman died and was buried in Rangoon Central Jail in August 1943. Documents held at the National Archives state that he died in Block 6 of the jail on 22 August 1943, a date that differs slightly from the date given by Commonwealth War Graves Commission. He was reinterred in Rangoon War Cemetery together with many of his Chindit comrades. His memorial plaque carries the inscription "Buried near this spot" since his remains could not be precisely identified from those of his comrades. He and his comrades were re-buried together. Private Henry James Ackerman was unmarried. He was survived by his sister, Irene May Parcell, and byDora and Ronnie Smith, the children of other sister. Photograph sent from The 13th King’s archivist.